English articles are not that frustrating and complex to understand, if they are presented in a logical and step by step progression. I have prepared a set of 10 ready-made lessons with Students Notes, Teacher’s Notes and Answer Key that are easy to understand, require very little preparation from you, and will save you loads of time. With at least 10 teaching hours ready to go, filled with controlled practice, speaking activities and authentic texts, your students will have fun enjoying grammar, and therefore learn quicker. Before you know it, your students will be getting their definite and indefinite articles right, and you’ll have more free time in the process to put your legs up with your favorite book, catch the latest movie in 3D, or have a coffee with your friends. 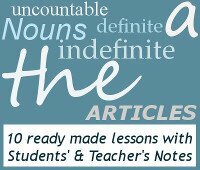 These lessons break down the grammar of articles into step by step, easy to understand bite sized chunks, making the lessons easy to understand for the teacher and the students. The grammar is therefore effortless, easy to remember, easy to learn and easy to use. These 10 lessons on English articles move progressively from easier to more difficult topics, so that it’s an effortless progression as the students build up their knowledge. The students will be able to assimilate the grammar in step by step pieces, broken up into learnable chunks that have already been written for you. So instead of searching through the grammar books, or the search engines, you can go for a cycle and enjoy the good weather. The lessons only use authentic texts. Your students will be exposed to real language, so they will be able to operate more effectively in the real world. Their English will be much more useful to them as they are exposed to English as it is really used, they will be able to even better understand native speakers, the media, magazines and movies. If they are wanting to operate in an English speaking environment, the transition will be so much easier for them as they are exposed to real language from the start. There are gap fill exercises, so your students will be able to get the basics right before moving onto more difficult activities. The controlled practice will encourage your students that they can get English articles right, and will build up their confidence. The students will be able to get plenty of practice with their English articles in many different ways so they won’t get bored. Both the students and teacher will be fully involved and have lots of fun. The more the students are exposed to something, the more they practice, the more they will remember and the more they will get right. You will be giving your students the best opportunity through repetition in creative ways to get it right in the classroom, and then get it right in the real world. There are activities for all different types of learners …. those who remember by hearing, speaking, touching, moving and writing. You and your students will get a real sense of accomplishment as you see progress by focusing on the individual learning styles of the students. All the activities are fully prepared for you – the drawings have been drawn, the tables have been created, flags have been copied, quizzes have been prepared, and the answers have been given. All that’s left for you to do is to read quickly through the material, write out some flashcards, and cut up the matching activities. The students can use their creativity in making up stories, both in writing and speaking. Soon, you as the teacher will be wanting to join in, to explore your own creative genius. The students will also be able to practice their speaking and writing skills and continue to grow in confidence while improving their overall English. Quotes are a great springboard for speaking activities, as they give the students opportunities to express their own opinions, while being exposed to others’ points of views from different walks of life and divergent cultures. Everyone will walk out of the lessons feeling like they’ve learn more than just language. Everyone likes to talk about themselves and express their opinions. With ready prepared questions and speaking activities, your lessons will not be teacher focused. You will feel like you are sitting down with your friends over a cup of tea, and the only extra work you need to do is write down some of the students’ errors as they speak, and correct them at the end of the lesson. The students will love it, you don’t have to do any preparation, and your teaching will be focused on the exact problems that the students need correcting. Win-win-win! These e-lessons start off with some guidance notes for the teacher on how to present the grammar of to the students so that they are fully involved and participating. So whether you’ve had little or no teaching experience, you’ll be able to guide the students through the lessons so they won’t get bored, they will remember more and will learn quicker. We use countable and uncountable nouns all the time. It’s just part of everyday speech. It’s important for your students to get the basics right so that you can build on a solid foundation when you continue with the indefinite and definite article. Once you’ve gone through the basics, your students will find learning articles so much easier, and they’ll therefore be easier to teach. Included in the lessons are the way we deal with the names of places, companies and organizations. Knowing how to talk about these things properly is not only helpful in general English, but is also useful for business English. Your students will be able to discuss companies and businesses without error, and will sound more professional. They will be delighted that you can target an area that is essential to their work and practical use of the language. Talking about places, people and nationalities when it relates to English articles can seem daunting. But with these clearly laid out explanations and fun games, your students will be planning their travels and communicating around the globe with consummate ease. Not to mention the fact that their geography as well as yours will get a good top-up. Teaching English articles is indispensible if you want your students to speak well. Articles are used in every single sentence (especially the zero article), so give your students the best possible chance to speak correctly by going through this thorough course that will cover everything from the basics to the more complex. I have tested these lesson on my own students, so I know they definitely work. We’ve had plenty of fun and laughs along the way as well. These 10 lessons on English articles are ideal for upper intermediate, advanced and proficiency level students. Of course, all the answers have been provided for you, so you don’t have to do the extra work. And you will get the answers right every time. 60 day money back guarantee with no questions asked.